Harvest dates play a crucial role in determining the quality of grapes. The choice of harvest dates and locations, particularly in red table-grape grape varieties, is planned based upon the color development of the grape clusters which indicates the maturity of the fruit. The traditional process for evaluating the amount of ripe, fully-colored fruit is done manually by visual assessment. But this process is subjective, prone to errors and the number of locations where a grower will evaluate the fruit development is statistically insufficient given the size of commercial vineyards and the variability in the color development. Therefore, an automated approach for evaluating color development is desirable. We, at CMU, have developed a vision based algorithm that can categorize clusters of grapes into different stages of fruit maturity and measure the rate and variability of color development across large commercial vineyards. For instance, we measured the rate of change of the grape from its initial immature green colouring to the ripe reddening of its skin. We collected images from 3 consecutive growing seasons of the Flame Seedless table-grape variety, from 2014 to 2016. We used color development measurements on these images. Doing this, we were able to measure high-resolution current state of color development and also we have constructed a prediction model that maps the current state of the fruit maturity to its future state, within a growing season. We repeated this process for the Crimson Seedless variety for a single growing season, that of 2016, and were able to develop a similar model. Figure 1: Grape clusters categorized into 4 grades depending on their color development. We categorize the clusters of fruits by their color development into four grades, A to D, with grade A being least mature fruit and grade D being harvestable (Fig 1). For our initial calibration, we randomly select 30 plots in the vineyard. Each of these calibration plots is visually assessed by an industry expert - a viticulturist or grower - and a color development value is assigned for each plot for each of the four grades. 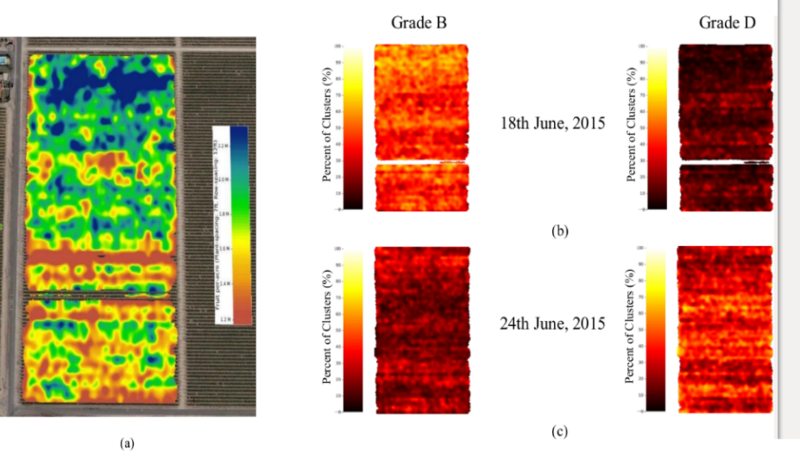 The images of vines from the calibration plots are paired with the corresponding color development value and grade assigned by the industry experts (Fig 2). Figure 2: Automated grading of grape clusters. (Left) Raw image of grape clusters in the field. (Right) Image of detected grape clusters and their associated grade based on color development. Berries that are well-colored (Grade D) are highlighted by red, immature berries (grade A) are highlighted by green. 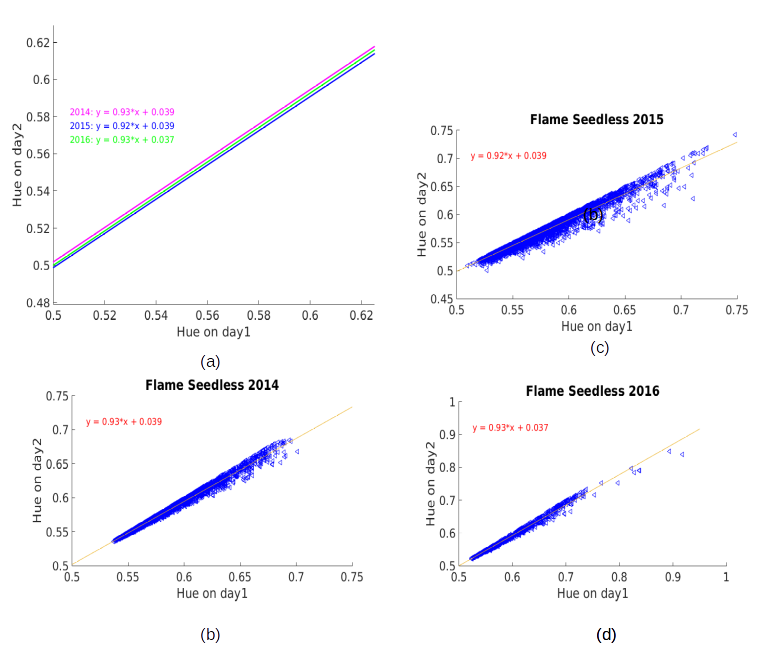 Figure 3: Correlation between Human measurements and Image estimates for the (a) Flame Seedless and (b) Crimson Variety. We combine the percent of clusters of individual vines for a given grade across the vineyard to generate a spatial map as shown in Fig 4. Fig.4b and 4c presents maps of the color development on two separate days for Grades B and D obtained using image measurements. These spatial maps are compared with the spatial yield map shown in Fig.4a. Figure 4: Spatial Maps of the Flame Seedless Vineyard: (a) Yield Map of the berry count across the field. Spatial Map of percentage of clusters for Grades B and D on the 18th June (b), 24th June (c). For computing the color progression, we collect images of the same location in the vineyard on different dates. We then develop a linear regression model that estimates the rate of change of maturity by comparing the color information of the same berries in the images collected on different dates. Figure 5. shows the average rate of maturity (or color development) in the Flame Seedless grape variety is consistent over all grades/hues of the fruit for the three growing seasons. Albeit our model does not include weather conditions and admittedly the past three seasons have been similar in weather patterns. In future years we will attempt to introduce weather modeling to correct maturity prediction in abnormal weather years. Figure 5: Forecasting model of rate of color development. We have been building this model over the past three years. A) shows the rate of color change has been relatively consistent. B, C, D) show the raw data used to fit the color development model.